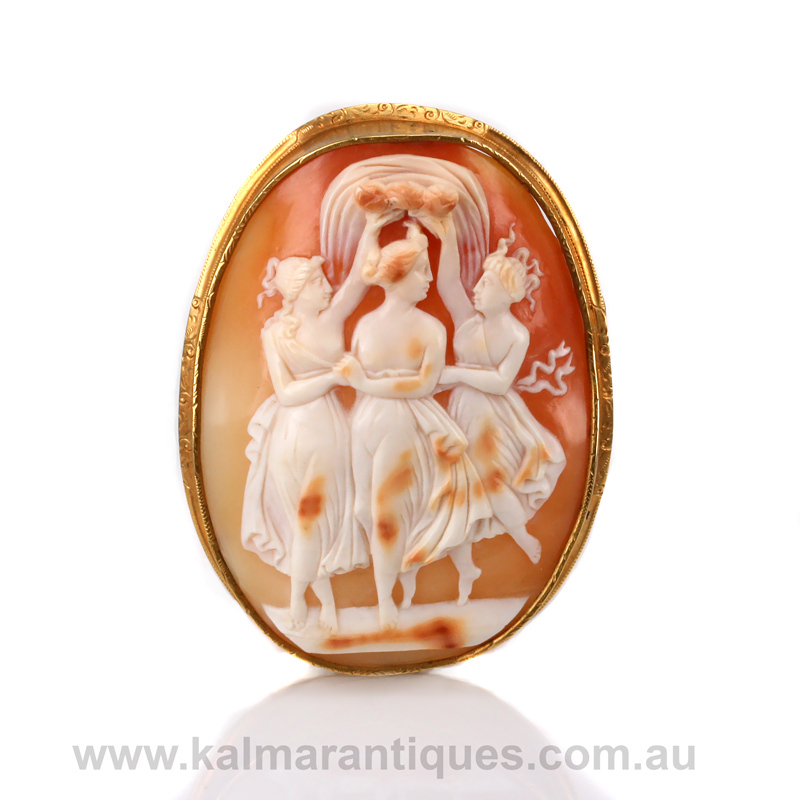 Product code: R908 Categories: Antique, Antique Cameo. The 3 graces were the 3 daughters of Zeus, named Aglaia, Thalia and Euphorosyne and for centuries have been imortalised in art from paintings, sculptures and cameos as can be seen here in this gorgeous antique cameo of the 3 graces. Dating from the 1870’s, the cameo has been beautifully hand carved in shell and the attention to detail is spectacular and shows what talent the carver had. There is so much life and a sense of movement when you admire this cameo and thanks to the natural colouring of the shell, will allow this to be so easily worn on any coloured outfit and always fit right in. Measuring 7.7cm by 5.2cm, the cameo is mounted in a 9ct gold frame that itself has delightful and charming engraving on the sides. With a romantic classical scene that goes back to Greek mythology, this is such a character filled antique cameo if the three graces that will always be admired and a real talking point.